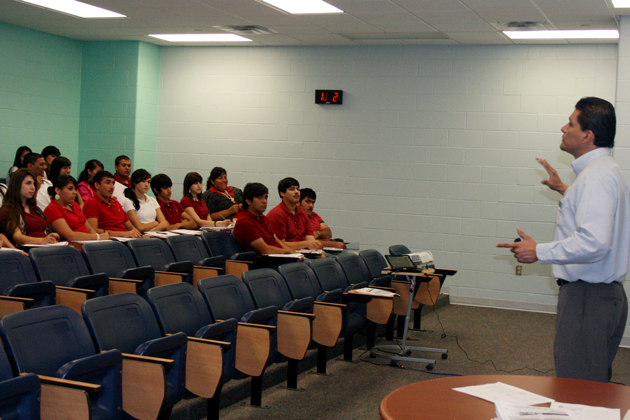 A seminar was held recently for Grulla High School students to prepare them to take the SAT and ACT College Entrance Exams. Colleges and universities utilize the scores of these tests to evaluate student applications for acceptance. The training session is the first step in preparing the students to understand the content of such examination, the importance of the scores and to prepare them to take the tests. Mr. Carmelino from The University of Texas Pan American conducted the training which was coordinated by Mr. Rick Solis-College and Career Adviser, Mrs. Lily Alvarez and Melissa Salinas, Guidance Counselors. This training was one of many activities that Mr. Solis and his staff in collaboration with Dr. Pablo Martinez (Principal) have scheduled in order to insure that the students are well prepared to meet the requirements for a post secondary education. (RGCCISD Photo).